Kick Axe, a heavy metal rock and roll band with some Saskatchewan connections and onetime regulars at the A-Four night spot, is riding a hot streak. They played three dates with the Scorpions in Toronto, Quebec and Montreal, being introduced to 45,000 fans. They are currently working on a tour of their own in Texas and will connect with Quiet Riot's tour in Sacramento, starting Sept. 21. 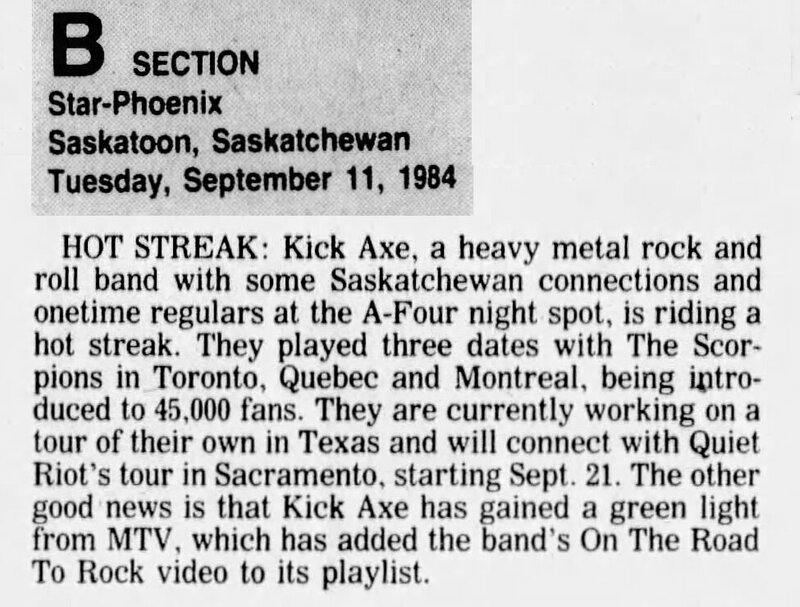 The other good news is that Kick Axe has gained a green light from MTV, which has added the band's On The Road To Rock video to its playlist.